In this article, we’ll discuss some of the top trends in the market today. The biggest catalyst to changes in the market is the tax cut which we reviewed in depth previously. As you can see from the charts below, the tax cut has caused S&P 500 earnings revisions to move upward 75.2% of the time. That’s a record high, with stats going back until 1995. The sectors doing the best are consumer staples (83.9%) and financials (80.6%). 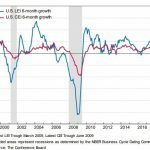 Total earnings growth is expected to be about 14% in 2018 as aggregate earnings estimates are up which is very unusual for a year not following a recession. 2018 went from being a late cycle year with decelerating upward revisions to a record year because of the tax cut. The crude futures net speculation as a percentage of oil is near a record high which is helping oil prices move higher. While U.S. production is nearing a record high, the OPEC cuts, global growth, and the weak dollar have helped the commodity reach 3 year highs. Keep in mind, higher oil prices help many state economies because of the fracking revolution. 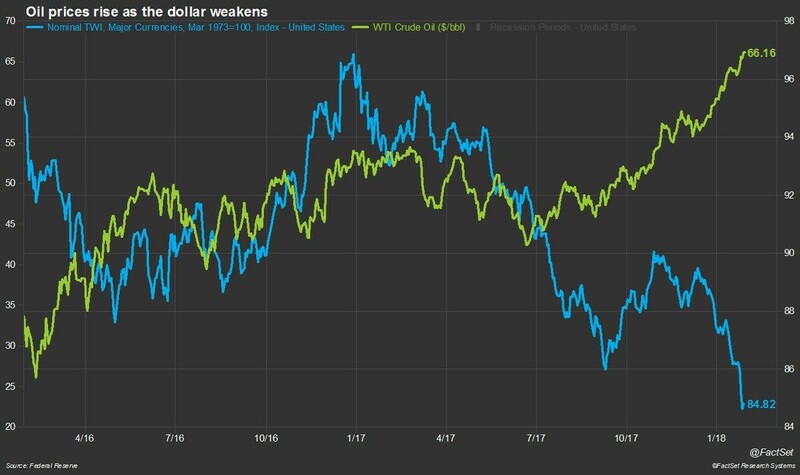 The dollar downtrend and oil price uptrend, shown in the chart below, is the most important macroeconomic correlation right now. The dollar is being talked down by the Trump administration. Occasionally, the administration is forced to walk back the comments, but the market is able to read between the lines. It might not be the best idea for America to have a weak dollar. A weak dollar helps domestic manufacturing principally, but as of 2015, the sector’s value added was only 12.27% of GDP. The weak dollar appears to be doing its job on that front as the flash manufacturing PMI hit a 34 month high in January. On the other hand, a weak dollar increases price inflation which is why you see higher oil prices and the CRB commodities ETF rallying. This hurts the consumer’s purchasing power. The Fed has been hoping for inflation this entire cycle, but awakening the beast will eventually catalyze a recession as there will need to be rate hikes. A weak dollar hurts foreign bondholders. That could be a problem because the U.S. deficit is expected to increase as a result of the tax cut and the heightened healthcare spending caused by an aging population. 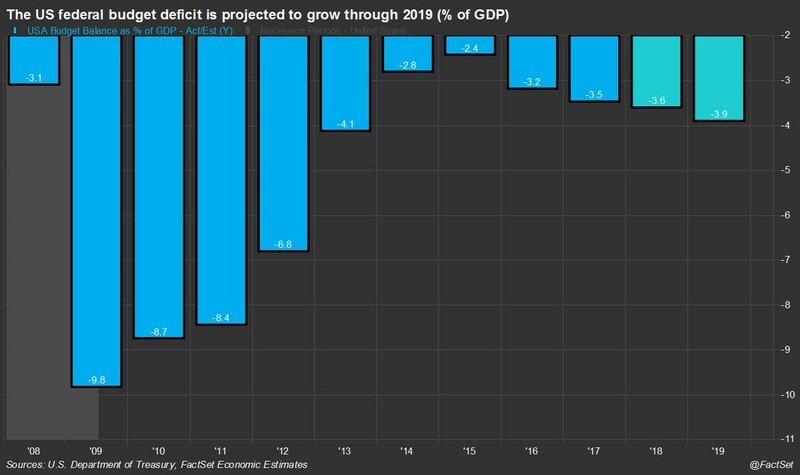 As you can see from the chart below, the deficit is expected to be 3.9% in 2019. The economy needs to grow to make up for the tax cut. 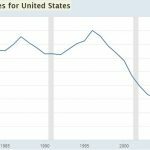 If a recession occurs in the next couple years, a huge hole will be blown in the country’s balance sheet. The trade this year has been long stocks, long oil, short the dollar, and short treasuries. The last leg of that trade can be seen in the chart below. The 10 year treasury yield is approaching 3% because of increased growth expectations and inflation expectations. The 10 year breakeven inflation rate is at 2.11%. This decision by the Trump administration to ramp up growth and rates sounds good because GDP growth goes up, but it’s dangerous because of the higher yields on the debt. This deficit increase is occurring while the Fed is unwinding its balance sheet at a rate of $20 billion per month. The initial burst in inflation, rates, and growth is welcomed, but it will become problematic when inflation makes new cycle highs. The economy can’t handle a recession now that the stimulative measure that was the tax cut was utilized. This tax cut had a dubious achievement when it was passed. The tax cut was less popular than some previous tax increases. The low approval rating was likely due to the uncertainty over what would be in the bill and the process by which it was passed. It seemed likely that the tax cut would become more popular once people realized that about 80% of Americans would be getting a tax cut, even if it was marginal. As you can see in the first two charts below, the approval of the tax plan went from 37% to 46% and the disapproval went from 58% to 49%. Those expecting to get a tax cut went from 33% to 41%. Even the Republicans are underestimating how many people will get a tax cut as only 63% think they will get a tax cut. The improvement of this plan’s popularity will help the GOP’s odd of doing well in the mid-term congressional elections. According to Monmouth, the Democrats went from a 15% lead in a generic congressional poll in December to a 2% lead in January. 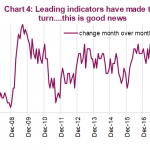 Consumer optimism is picking up as the popularity of the tax cut improves. The Conference Board Expectations index increased from 100.8 in December to 105.5 in January. 2018 could be a great year for the consumer because it will be optimistic and it is getting an increase in disposable income. 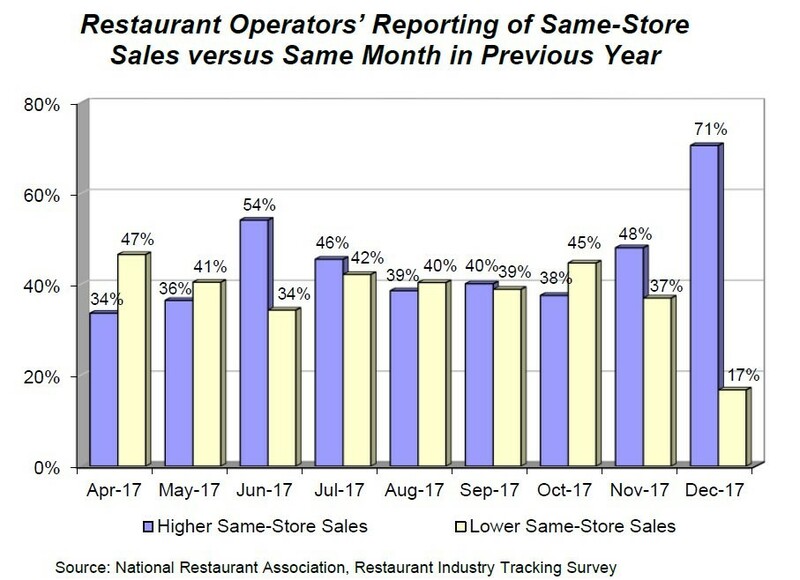 As you can see from the chart below, restaurants had a great December before the tax plan was enacted and people hated it. 71% had higher same store sales and only 17% had lower same store sales. The biggest positive of the Trump administration is the regulatory cuts. The Trump administration eliminated 1,500 planned regulation in the first 11 months of his term. In 2017, the administration eliminated 22 regulations for every one new regulation. 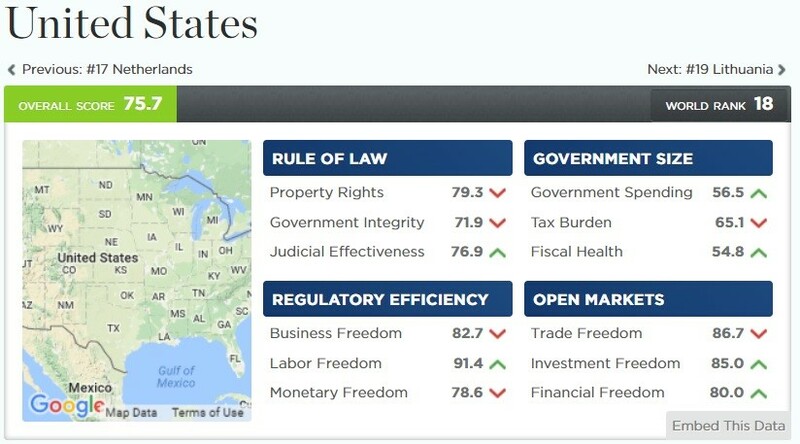 This will improve the business freedom index which declined in 2017 as you can see from the screenshot below. The U.S. was 18th in the latest economic freedom index created by the Heritage Foundation. It improved just 0.6 points. At the rate the Trump administration is cutting regulations, the U.S. will go up a few places in the next list. We provided a politically non-biased analysis of the Trump administration’s policies and the impact thus far. The budget deficits, depreciating dollar, and heightened inflation are negatives. The positives are increasing stock prices, increasing consumer spending, the tax cut becoming more popular, manufacturing growth, and regulation cuts. It’s a mixed bag which has led to a few strong trends such as rising rates. The ultimate questions are how high rates can go before stocks are significantly affected and how high inflation goes before a recession is catalyzed. We answered this question in the article titled The Inflection Point For Stocks & Bonds. 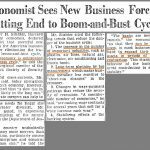 NextTechnological Unemployment: Should We Fear Innovation?